Bad to the Bone in the ITA! Bad to the Bone in the ITA!, a photo by NewYorkBrass on Flickr. 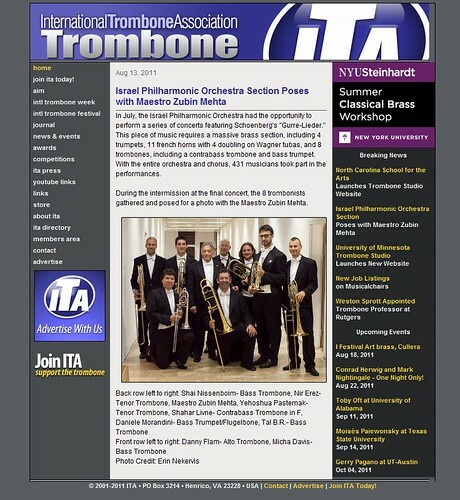 Grateful thanks to Diane Drexler and Taylor Hughey at the International Trombone Association Journal for allowing this group of goofballs to grace their pages! In back from left to right artist & instrument: Shai Nissenboim – Bass Trombone, Nir Erez – Tenor Trombone, Maestro Zubin Mehta – Stick, Yehoshua Pasternak – Tenor Trombone, Shahar Livne – Contrabass Trombone in F, Daniele Morandini – Bass Trumpet Flugelbone, Tal B.R. – Bass Trombone Front: Danny Flam – Alto Trombone, Micha Davis – Bass Trombone.